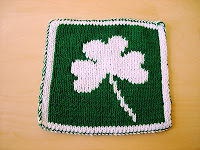 Sure it's a little late for St. Patrick's Day this year, but there are several reasons why someone may want to knit up a 3-leaf clover hot pad or dishcloth! I've been sitting on this for quite a while and in fact couldn't find the "actual" pattern I used for the hot pad I've pictured. I did find a chart that I could work from to create a new online chart. 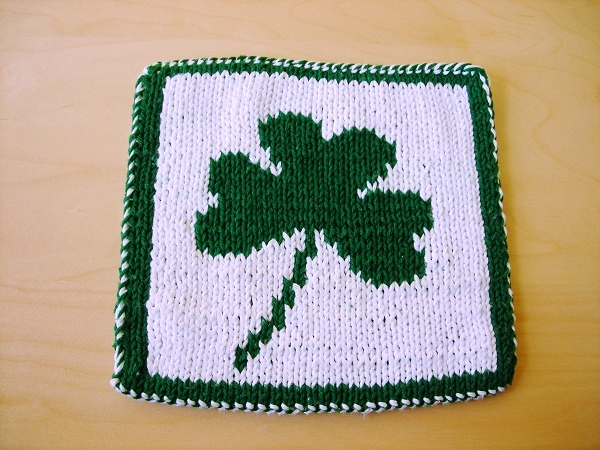 The finished hot pad was created using "double knitting". It is a technique where you knit a double thick item, but you knit the front and the back at the same time in mirrored images of each other. It's a fun technique to learn and a simple chart like this is perfect for doing it.